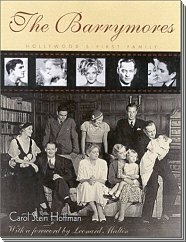 "The Barrymores" retails for $40.00, great book, highly recommended for photographs of John Barrymore and Dolores Costello. CLICK HERE for Book Reviews From Publisher's Weekly and Atlanta Qua rterly. Leslie Penn is an artist who paints excellent movie stars in pastels. Leslie Penn's Hollywood Pastels CLICK HERE for Hollywood Pastells from the 1920s to the 1950s Leslie Penn is your person for subperb artwork.